My most favorite place on the planet besides a stamp or scrapbook store is the beach! I just love the beach!!! I love everything about it. I love to feel the sand between my toes and the sun on my face and every summer we head off to our beach house to spend the month. For me, it’s the best month of the year and one day I hope to retire here with my wonderful husband and my girls, the furkids. Unfortunately, I can’t spend all of my time at the beach right now so, I brought the beach to my home by creating this cute little lamp. 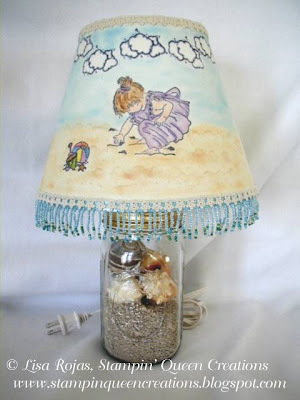 By using chalks, you can achieve a soft pastel look to your lampshade. When using chalks in a palette form here’s a tip: Instead of using make-up applicators, try tweezers and mini pompoms. Pick up the pompoms with tweezers and apply color. Getting into those small areas on stamped images will be a breeze! Since today is the first Monday of the month, that means that the Designer Craft Connection will be hopping!!! This month’s theme is “Summer Vacations” and since I spend part of my summer every year at the beach, I thought my beach lamp would fit in there nicely. And don’t forget since we are hopping today to go to the right side of my blog and find the Designer Craft Connection’s blinkie. Once you click on that blinkie, it will take you around to each of the designer's blogs that are participating in the hop this month. Normally that means anywhere from 40 to 50 different projects can be seen by hopping from one blog to the others. There is lot and lots of fun to be had, so please join me and my fellow designers in another round of fun and fabulous blog hopping with the terrific designers of the Designer Craft Connection. You won’t be disappointed!!! Step 1. Stamp girl, clouds and beach ball with Black inkpad. Stamp sand with Putty inkpad. Color stamped images with chalk pencils. Add color to sky and sand using decorating chalks, tweezers and pom poms. Step 2. After stamping and coloring is done, spray lampshade with sealer. Next, glue trims to top and bottom of lampshade with glue gun. Assemble lamp kit following manufacturer’s instructions. Pour sand into mason jar and add sea shells. What a beautiful lamp, love sea theme. Oh, this is so cute. I love the little girl picking up shells. Brings back memories.